After the massive success of my braised beef tendons I was left with the wonderful braising liquor that was flavoured with spices such as cinnamon, star anise, cloves, fennel and garlic and thickened with the deeply flavoured tendons. The Vietnamese noodle dish Pho instantly sprang to mind so I threw together this very quick supper the following night. It’s not a totally authentic version but it was absolutely delicious. Combine the stocks in a saucepan and simmer, add the ginger, fish sauce, palm sugar and continue to simmer for a few minutes. 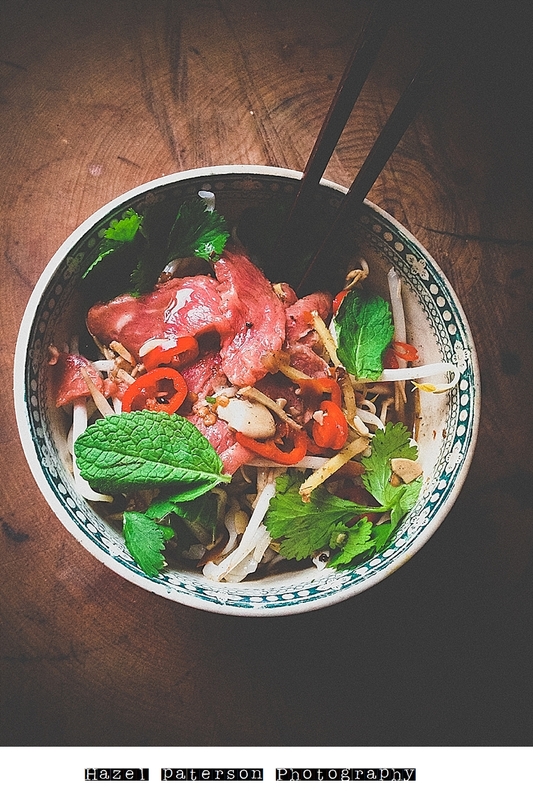 Place noodles in a big bowl and top with sliced sirloin and beef tendon, add a handful of bean sprouts then pour over the stock then sprinkle over your garnishes and dive in.